Those of you who have read my review of Fangoria’s Dreadtime Stories Volume 1 should remember the basics of this series. For those who haven’t, I’ll explain: AudioGo and Fangoria have teamed up to offer CDs and digital downloads of the streaming web series that plays on Fangoria’s website. However, these releases have extended versions featuring scenes that weren’t heard in the streaming versions! 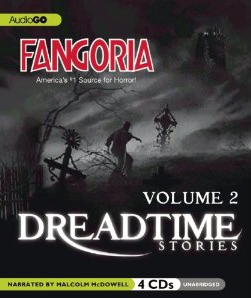 Although I enjoyed Fangoria’s Dreadtime Stories Volume 2, I would have enjoyed the collection a lot more if most of the stories didn’t blatantly telegraph the ending. Sometimes there’s admittedly a little mystery about the exact way the ending will come about, but the ending is spoiled all the same. This wouldn’t be nearly as obnoxious if it was only a single obvious hint, but Dreadtime Stories seems hellbent on hammering home how the story will end by constantly repeating the same line over and OVER again. Thankfully, “Table Scraps” and “Mercy” avoid this issue entirely. “Mercy” admittedly telegraphs the titular character’s eventual murderous conclusion in regard to soul-saving, but it’s hardly an issue to complain about since the listener is told that in the episode’s plot description. It’s also worth noting how “Talking in the Dark” manages to avoid this issue until the final leg of the story. Getting back to “Table Scraps,” the story is an absolutely must-listen if you’ve ever dealt with crazy conspiracy theories. In addition to the hilarious, but not over the top, characterization of the protagonist, I love how his pet theory turns out not to be the case (which tends to happen in this sort of tale). While the constant hints about the ending hampered my enjoyment of “The Final Battlefield” somewhat, I did find it interesting how it plays out more like a psychological drama dealing with a soldier’s post-traumatic stress rather than a horror story. That’s not a complaint, mind you. I thought it was quite fascinating and it reminded me of the sort of non-horror story that would play on classic radio shows like Suspense (despite the horror stories usually being the more remembered ones). As always, Malcolm McDowell is a pleasure to listen to and the music and effects are all top notch. The acting here is much better than the hit and miss mix of Fangoria’s Dreadtime Stories Volume 1 and only those who dislike hearing familiar voices in multiple stories (which is always the case in audio productions using a small stable of performers) will find any issues with the acting. Maybe it’s just me, but I swear they’ve changed the credits since Volume 1. Jim McCance’s role as the narrator for the credits seems to be more prominent this time around (which is well deserved, I might add) and there’s also a plug for how episode scripts can be downloaded for free at the series’ official website. Given that the entire collection clocks in at a little over 4 and a half hours, it should come as no surprise that the stories are spread over 4 discs packaged in unfolding cardboard slipcover. As was the case with the last volume, the slipcase is held in a cardboard box rather than a plastic jewel case. Unlike the last time, there’s a very generous coupon code for orders at AudioGo.com printed on the lid’s inner tab! Here’s hoping that future volumes include more such changes like these (and less obvious foreshadowing of the stories’ endings).